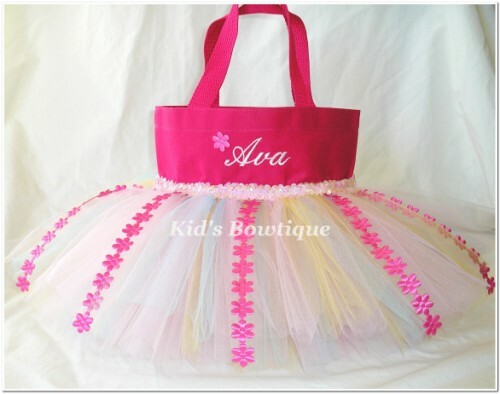 This is a Kid's Bowtique original tutu bag design. This pink tutu bag is made of a canvas bag that is approx. 10.5 X 8.5 X 2. The tutu bag has an extra full tutu of pink, yellow, and blue tulles for uniqueness, pink sequins at "waist" for dazzle, floral trim accents for color, and embroidery in light pink thread for personalization!